If you love news about the National Zoo and the animals, then we have a great story for you! Just recently, a new baby orangutan was born. This is a key moment for the critically endangered species which has suffered from population drops. This is due to a number of factors including palm oil plantations, deforestation and hunting, all posing a serious threat to the existence of this magnificent creature. The mother, known as Batang has successfully given birth to a healthy baby boy at the Smithsonian National Zoo in Washington DC, and the zoo has confirmed that this is the first male orangutan to be born in 25 years! The zoo released a statement to confirm the news and this is a big deal for a creature that has been critically endangered for some time. The tiny ape was born on September 12th at 8:52pm to nineteen-year-old mother Batang and the father Kyle, with successful breeding taking place in January of this year. The infant has been clinging to his mother since birth and the early signs are good for the little one’s survival chances. Subsequently, the Great Ape House at the zoo will be closed so that mother and child can bond before viewings by the public are permitted. Since the announcement of Batang’s pregnancy, the zoo has kept the public updated with weekly reports of the mother and infant’s progress and will continue to do so as he continues to grow. It is a historic moment for DC’s National Zoo, and staff are naturally very excited at the prospect of watching the infant take his first steps into the world and meeting the other orangutans. Zoo staff have worked tirelessly to help Batang through pregnancy and to prepare for being a mother by teaching the ape a variety of techniques such as presenting the baby for feeding and holding him upright. This should give the infant the best possible chance at survival. The Bornean orangutan population decreased by a massive 80% within the last 75 years resulting in the species being marked as critically endangered by the International Union for Conservation of Nature. This highlights to us how crucial the birth on Monday has been for the survival of the species overall and the two 19-year-old apes were paired following a recommendation from the Association of Zoos Species Survival Plan commonly known as the SSP. Zoo staff are optimistic that the infant will thrive in the environment that they have created, and with three years of training under her belt, we really hope that Batang will be able to raise the infant successfully. 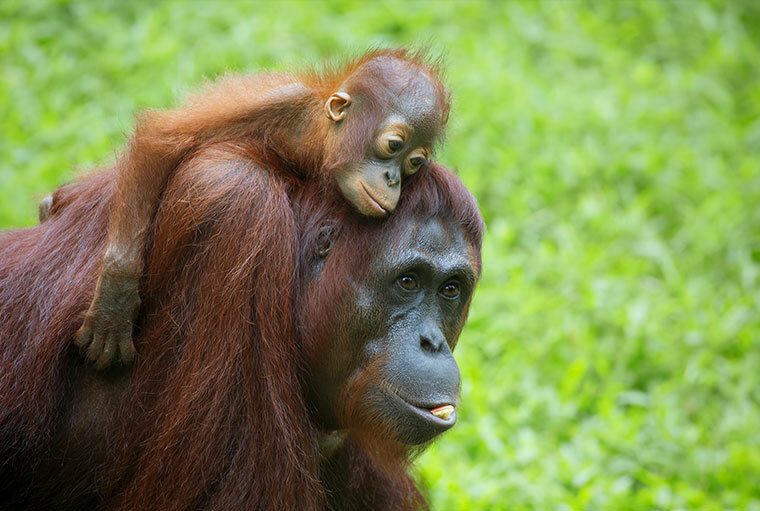 For a bit of perspective, there were 230,000 orangutans in the wild one hundred years ago but now there are only 69,000 with 7,500 of those belonging to the Sumatran family. Hopefully, we can reverse this decline with this tiny newborn certainly giving us hope for the future!